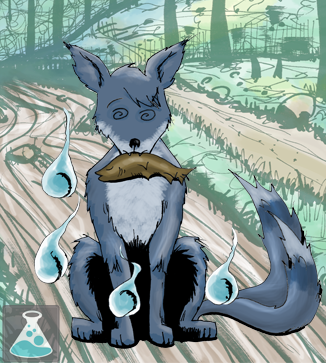 The River Kitsune is an aqua-fur-colored Kitsune with two tails who resides in the Wilderness Realm. She is rather goofy in in the presence of others, and frequently speaks (and eats) before she thinks. This impetuous and overhasty attitude often reveals her naivety to the ways of her Kitsune kind. Her rashness and free spirit tends to get the River Kitsune into an array of astonishing adventures and mischievous moments! Surprisingly and somewhat contradictory to what is generally expected of a Kitsune’s appetite, the River Kitsune does not like to eat tofu, much preferring fish from a stream and other fresh water creatures. She loves to eat and she will rarely be seen without a fish in her mouth. Spending a large portion of time in ponds, streams, and inland rivers, the River Kitsune appears to live a peaceful existence. She draws great potency from the calm waters of these ponds and streams, regardless of their tranquil nature. Though she can be silly and unwary, that doesn’t mean that she is unpassioned. It may be rather difficult to accomplish, angering the River Kitsune will unleash a great torrent of power within her, and one would be wise to keep away if this should ever happen.